I first discovered Bulumu granola a couple of years ago when I bumped into Bulumu co-founder (and my former high school classmate-disclosure) Jasmine sampling it at my local Whole Foods. Excited for her and happy to buy local, I decided to buy a bag. I’ve been buying it off and on ever since. Bulumu stands for “Buckle up, Love you, Miss you”, which is apparently how Jasmine and her mom would sign off on emails while she was traveling the world in pursuit of her dreams of being a professional triathlete. 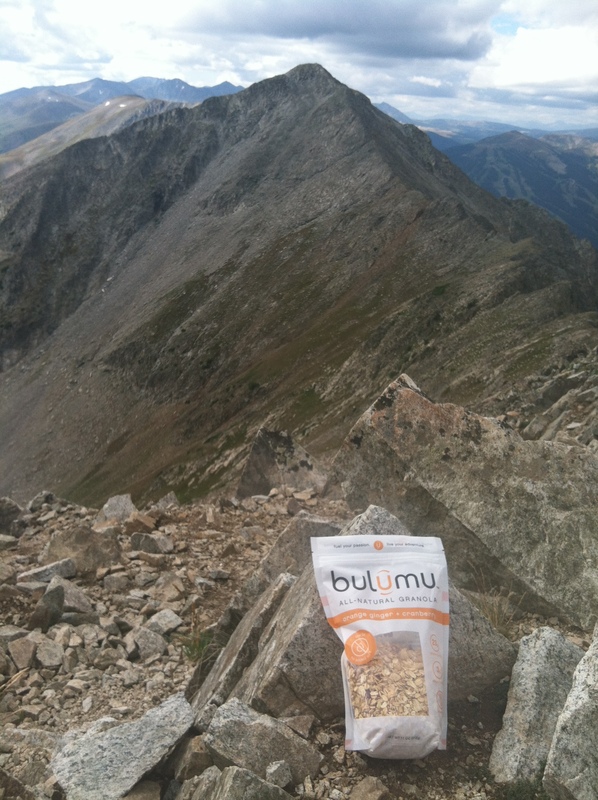 Bulumu is marketed as being an all natural, lower fat version of granola and is somewhat marketed towards athletes and active people in particular. It claims to sit lighter in your stomach than typical granolas and therefore to be a good pre-workout option that won’t cause GI distress. Nutrition Information: This may vary slightly amongst the different flavors, but ¼ cup (1 serving) has about 110 calories, 2 grams fat, 18 grams carb, 6 grams sugar, 2 grams fiber and 3 grams protein. That is a lot less sugar and fat than the average granola, making Bulumu a good option for granola lovers who are watching their weight or sugar and/or fat intake. It’s also significantly lower in calories, as most granolas average 140-180 calories per ¼ cup portion (due to containing more fat and sugar). Ingredients are mostly organic and for the orange ginger + cranberry flavor (my personal favorite) are as follows: rolled oats, organic agave nectar, orange juice concentrate, walnuts, dried cranberries (cranberries, sunflower oil), crystallized ginger (baby ginger, cane sugar), honey, ginger juice (ginger, citric acid), natural orange flavoring. You’ve probably heard the adage that if you can’t pronounce the ingredients in a product you probably shouldn’t buy it. No worries here as there are no funky unnatural ingredients in Bulumu, another thing I like about the product. Price: Bulumu seems to cost about $1 per bag more than most other comparable granolas (Kashi, Kind etc). It typically goes for $5.99 at Whole Foods and for some reason last I checked it was more- $6.99- at King Soopers. A bag contains 11 servings, which breaks down to about $0.55 per serving. Taste review: Bulumu does taste a bit different that typical granolas, mostly due to the lower fat and sugar content. It’s not as sweet as most granolas, nor as crunchy. The consistency is also a bit different, as Bulumu does not come in typical granola clusters. As the website says, “OATS DON’T GROW IN “CLUSTERS”.™ That’s why we toast our oats individually without all the oil and sugar”. Although I’ve only seen (and tried) 3 flavors in the grocery stores, according to the website there are 4: orange ginger + cranberry, vanilla almond + fruit, cinnamon chai + walnut, honey hemp + blueberry, and maple pecan + vanilla. As to its claims about being a good pre-workout fuel, I can’t totally say. I’ve never been one for plain granola, so I typically use Bulumu in Greek yogurt, which doesn’t tend to do well with my stomach before workouts. It makes sense based on the ingredients, but I don’ think I’ll ever down a handful of dry granola before a run to confirm! Overall: I like the concept of Bulumu, that it’s geared towards athletes and active people and attempts be as unprocessed and natural as granola can be. I also like that it’s a Colorado brand so I feel like I am supporting a local business when I splurge on a bag of it. It is a bit pricey though for those of us watching our budget, and some might find the flavor a bit plain if used to traditional granolas. However, I do think it’s a healthy option and will probably continue to buy it occasionally-when it’s on sale. You’ve heard by now that quinoa is good for you. Whole grain, high protein, high fiber, and gluten free….need I say more? Plain quinoa, however, is a little boring so spice dinner up with the recipe below. It saves well for leftovers and can be served with a protein and veggie of your choice for a complete and delicious meal. 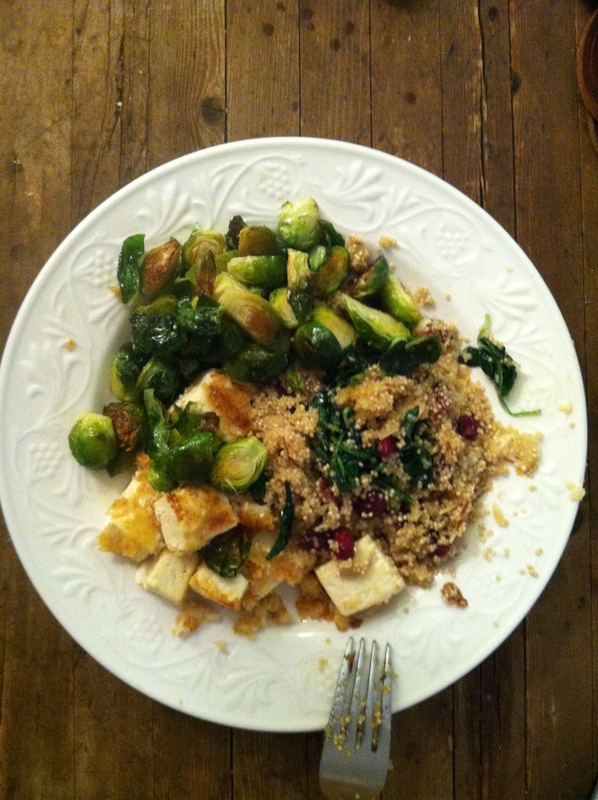 Tofu and Brussels sprouts make it a delicious and healthy meal! Cook quinoa based on package directions using vegetable broth instead of water (usually 2 cups liquid for 1 cup quinoa and simmer for 15-20 minutes). Add dried cranberries and almonds during last 2 minutes of cooking and stir. While quinoa cooks wilt spinach in olive oil over medium heat. Add cooked spinach to quinoa mixture and stir to fluff. Serve warm.